Eleven years ago, just a few weeks after our wedding, my wife and I drove from California to Wyoming, where we lived for six months. Along the way, we made many sightseeing stops. Utah had so many beautiful areas, I always wanted to spend more time there. 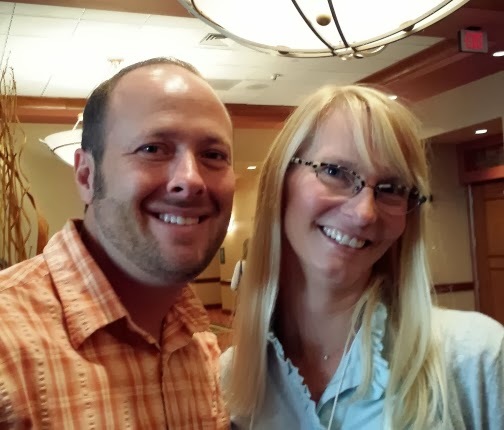 So when English teacher Cassie Cox asked me to speak at her school, I immediately said "Yes!" Two years later, we finally found a time that worked for both of us. 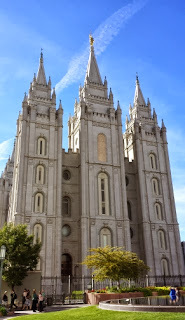 I was Utah bound! When people think of the Salt Lake City area, they often think of Temple Square. And on my last day, I did visit there. ...and knew it was going to be a unique author visit! Eleven years ago, one of the towns I thought looked so beautiful was named (appropriately) Eden. When Ms. Cox asked me what I'd like to do in my free time, I mentioned stopping in Eden for dinner. I knew YA author Wendy Toliver lived there and suggested that maybe she'd be want to join us. Well, Ms. Cox was a friend of hers, and I was soon invited to Ms. Toliver's home for dinner! Joining us were local teachers, librarians, spouses, and...Sara Zarr! We discussed books, censorship (after all, it was Banned Books Week), and Utah's very unique qualities. 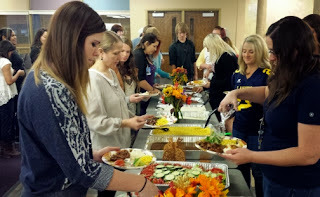 It was a wonderful and delicious (Ms. Toliver can write and cook!) start to my author visit. The next morning, I spoke at two high schools in Ogden. 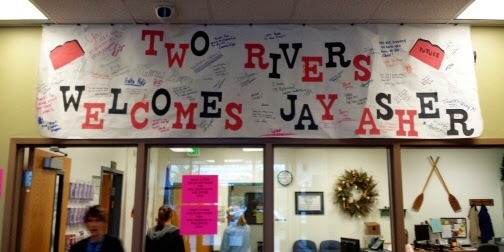 The first school, Two Rivers, let me know I was in the right place once I arrived. 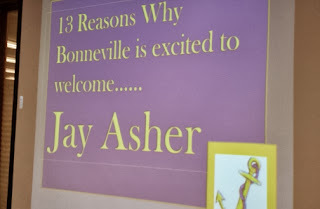 After my presentation, several students from Two Rivers were driven by their principal to another high school, Bonneville, where we joined even more students for lunch in the library. This catered lunch, apparently, was nothing like what the other students were being served in the cafeteria. (Which is why you should always eat in the library!) While we ate, a PowerPoint ran on a couple of screens with thirteen quotes from students about my visit. That evening, I joined several people at a delicious Italian restaurant, Zucca Trattoria. 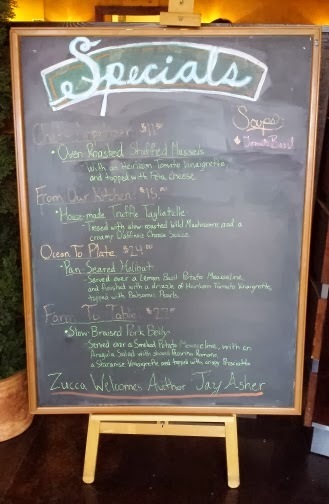 Check out the last line of their Specials board! 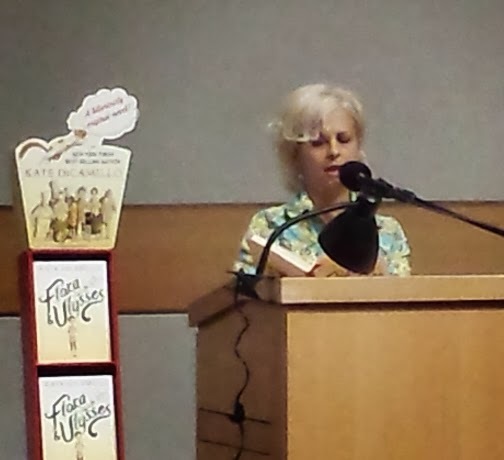 The next day, I spoke at the kick-off of the Utah Humanities Book Festival. The main Salt Lake City Public Library is one of the most stunning libraries I've seen, and I checked it out a bit to work off the nerves that always come as I wait to speak. But I had nothing to worry about. 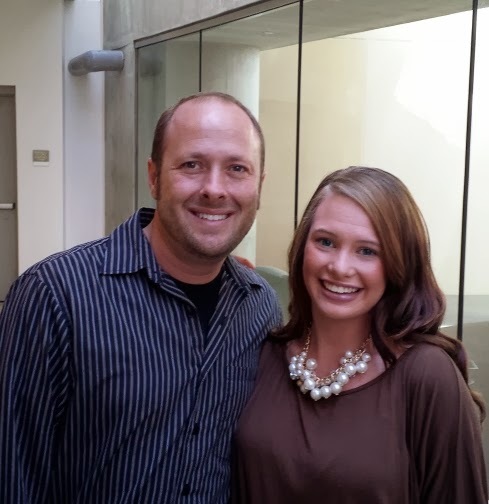 High school senior Kylee Carlin gave me such a great introduction, even I couldn't wait to hear what I had to say! 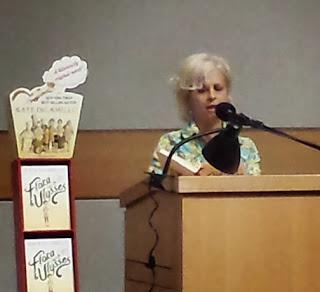 When I was done signing books, I got to sit in the audience and hear Kate DiCamillo speak. I had to leave before getting the chance to personally meet Ms. DiCamillo, but her reading and Q&A was very entertaining. 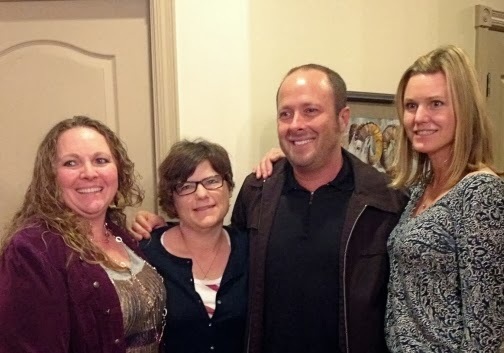 And the next time we're both in the SLC area, I suggest we all have dinner at Wendy Toliver's house! I used to hate country music. 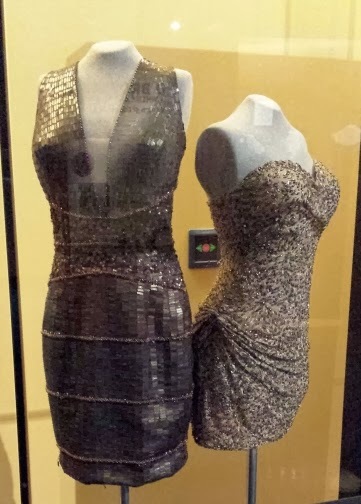 I found it so...twangy! God gave us vibrato for a reason, y'all! 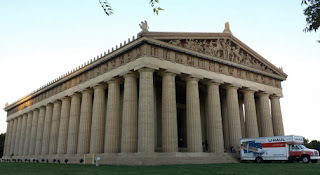 But over the years, especially from a historical aspect, I learned to appreciate it. 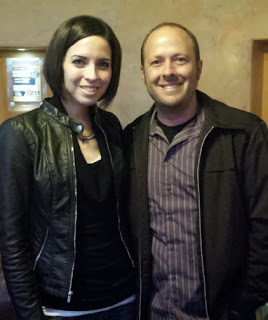 When my wife began singing in a bluegrass band, I actually learned to really enjoy certain aspects of it. And now, after spending a few days at its epicenter, I will actually call myself a fan. 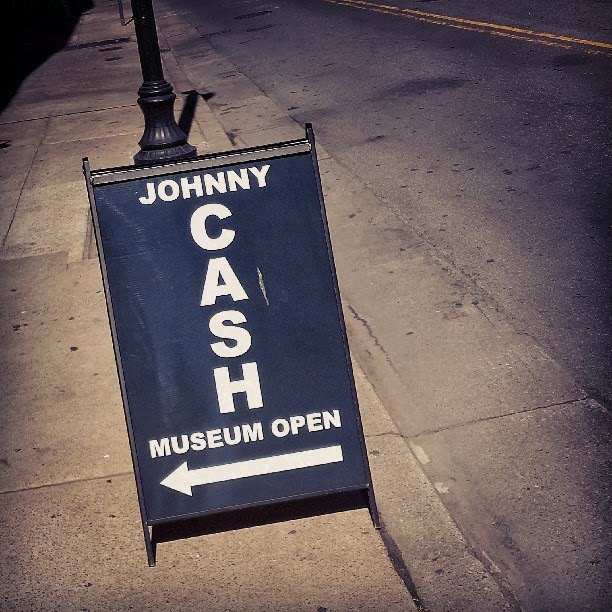 Yes, a few days in Nashville can do that. 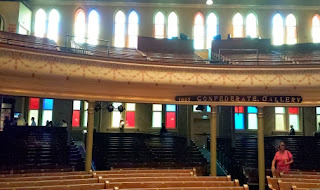 Before the conference officially began, I toured the Ryman Auditorium. 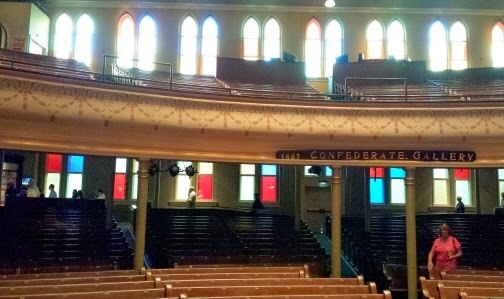 It's referred to as the Mother Church of Country Music, for its history with the Grand Ole Opry radio show and its appearance. 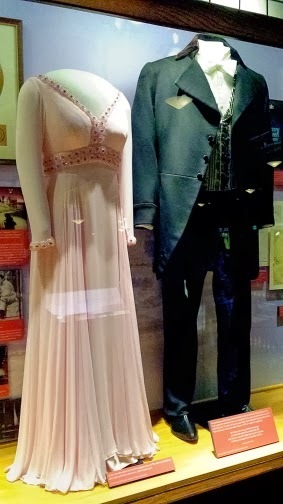 They have instruments and clothes on display from different acts that performed there. One legendary duo that first met backstage at the Ryman was June Carter and Johnny Cash. At the conference, I gave a two-hour workshop on writing suspense, a 45-minute opening keynote about my journey as a writer, a one-hour talk on co-authoring a book, one hour of Q&A, autographed some books, gave twelve writers critiques on the first ten pages of their manuscripts, and did a little author fanboying of my own. I bought Kristin O'Donnell Tubb's Selling Hope. And since a good chunk of this post is about country music (which I'm now able to write without gagging because I've come a long way), an awesome tidbit is that Kristin's husband is Ernest Tubb's grandson. 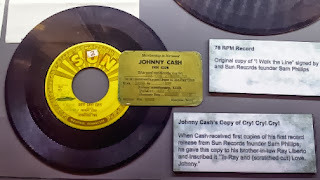 And Ernest Tubb is a huge figure in country music! 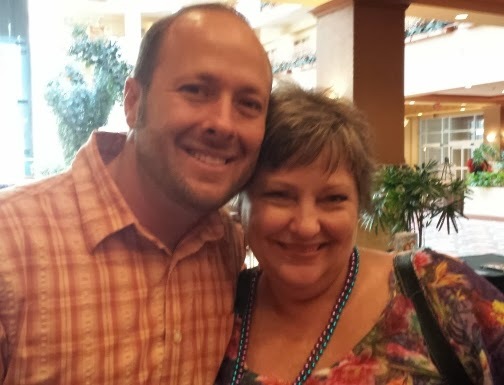 It's always nice to meet up with Candie Moonshower. We both won SCBWI's Sue Alexander Award years ago, and have been bonded by it ever since. I can't go to an SCBWI conference without bringing something home for Izzy. This time, he got a signed copy of this book by Shellie Braeuner. 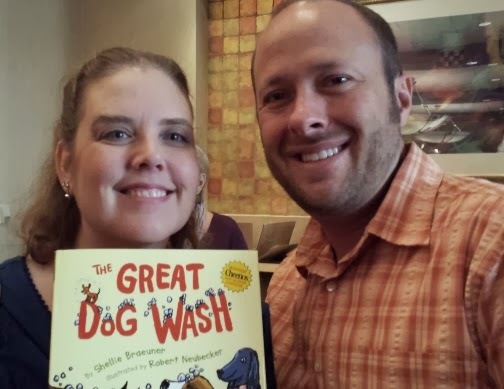 She even personalized it with a doggie joke about garbage cans because she knew of my li'l one's fascination with all things garbage truck related! After the conference, the faculty and organizers dined at Monell's at the Manor, southern comfort food served family style. And oh my goodness, this must've been my favorite meal in years! I ate as much as I wanted of some of the yummiest food to ever grace this planet. Was it healthy? Don't bring me down, man! It was yummy and let's just leave it at that. Then it was off to the new home (since the 1970s) of the Grand Ole Opry. 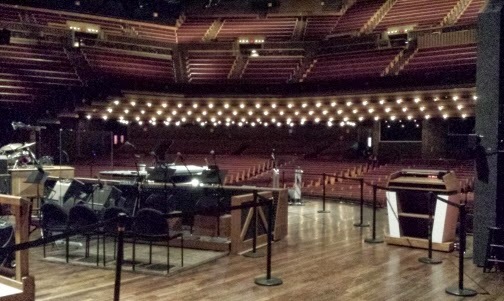 It was honestly an emotional experience, after hearing the backstory of the Opry, to step onto the stage in the same way a musician would. One thing I love about the tours I took is the way so much of what I saw paid respect to what came before. 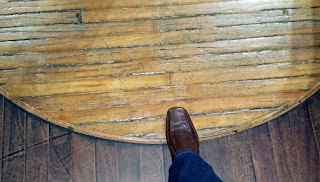 When they moved the Opry production from the Ryman, they cut a circle from the stage (not from center stage, but from the side so it would contain the historic footsteps of all the musicians, not just the center stage performers), and placed it into the new stage. And yes, even before I knew I'd be coming to Nashville, I watched the TV show of the same name. So I just had to stop by the Bluebird Café, a real venue routinely highlighted in the show. But apparently I wasn't the only one to think of stopping by. 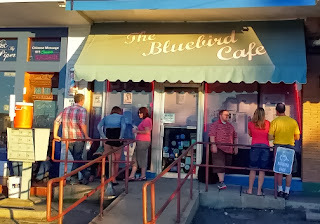 The place was packed, both inside with patrons and outside with wannabe patrons. They even placed a jug of water outside to keep people hydrated as they waited. Wasn't that nice? But I didn't have time to wait in line. The Country Music Hall of Fame and Museum walks you through the music's folk and bluegrass roots to the more pop country of today. Again...history! 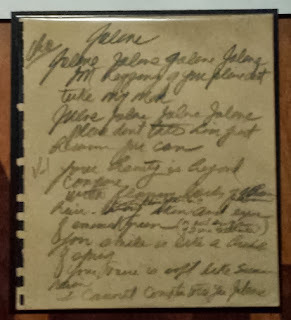 There were instruments, recordings to listen to, and handwritten lyrics to songs like Jolene, by Dolly Parton. There were also stage clothes on display, even from the fictional Nashville on TV. These were the dresses worn by Rayna and Juliette when they sang Wrong Song at the Ryman Auditorium. 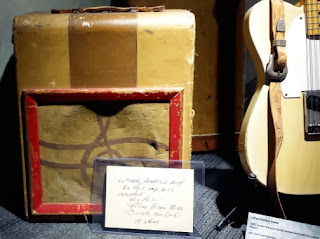 On this amp, Luther Perkins recorded the guitar parts for some of Cash's earliest and biggest hits. And here's a record from the first pressing of Cash's first recording session. I love historical things like that. No one could've guessed where those recordings would lead. They had no idea. 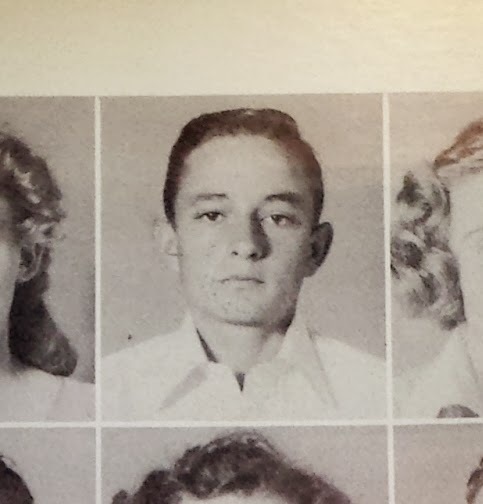 And since I write for teens, here's Cash's junior year photo from his high school yearbook. This guy had no idea what was coming down the line. Last Friday, I spoke at the Cornelia Connelly School in Anaheim, CA. Everyone at the school had read Thirteen Reasons Why prior to my presentation. That, as I've said many times before, makes for a very fun visit! I always like looking around school libraries. This library had a nice display of books students might like if they wanted something similar to Thirteen Reasons Why. If you look closely at the audience in the photos below, you'll notice a lack of something. Yep. No boys! Apparently my talk was optional, and the only people interested in hearing an author speak were girls. So while I'm glad they were there, it's very disheartening to see how little boys are into reading. Thank you to all of the students and faculty who made this such a wonderful visit! The timing and location of this visit worked in my favor for something unrelated to being an author. As a kid, I was totally into He-Man and Thundercats. I actually went through rolls of film (remember that stuff?) taking pics of my action figures in action, moving them slightly between shots so that I could create a flipbook. The first thing I remember really investigating as a possible career was that of an animator. And that was mostly because of those cartoons (and Ducktales, of course!). So where is all this going? Well, see...about a half-hour from Anaheim was...um...well...a He-Man, Thundercats, Teenage Mutant Ninja Turtles convention (TMNT came around a little too late for me to get into as a kid), so I went. There! I said it! I've never been to any sort of fan convention, and I've always wondered what they were like. So I went! There! Say what you will! And it was amazing. I got to meet the voice of Lion-O from Thundercats. 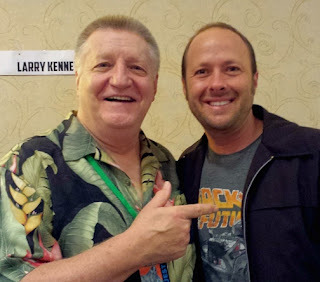 Not only does he do many other voices, but he's a very funny dude. 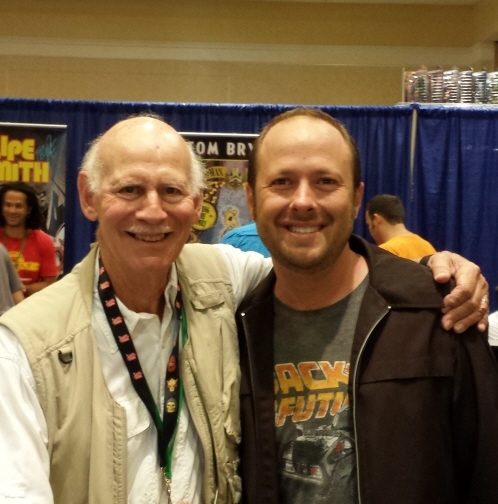 Then I met the voice of Skeletor from He-Man, Alan Oppenheimer. He's a very nice guy who chose to do a high-pitched, more comedic voice for the villain because he didn't have much interest in playing someone more menacing. That unusual choice changed the way the creators saw that character and then wrote that character. 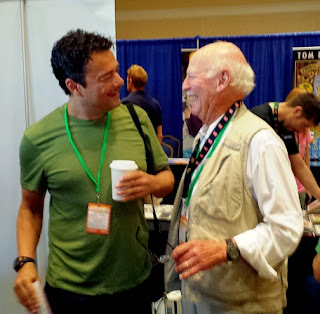 And I was lucky enough to be the first person to capture the meeting of the original voice of Skeletor and the most recent voice actor, Brian Dobson. I love this shot because you can see the respect between them. Here's Mr. Oppenheimer, and then Mr. Dobson, giving the audience what it wants! For me, the best panel over the two days was the Thundercats panel, which featured two writers and four voice actors. All these years later, the camaraderie and love between the actors was obvious. The respect was definitely there on other panels that featured actors from later incarnations of the various shows, but not the same love. I'm sure that has to do with how the voices were recorded. Now, the actors mostly go into studios alone. Back then, the actors were usually in the room together. 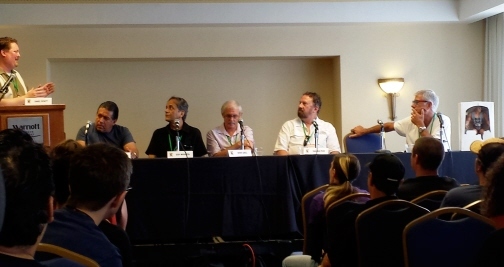 The panel below featured several of the people who came up with the concept and design for the He-Man figures. The ability to hear from the actors, writers, and toy designers behind so much of my childhood was fascinating and a little surreal. 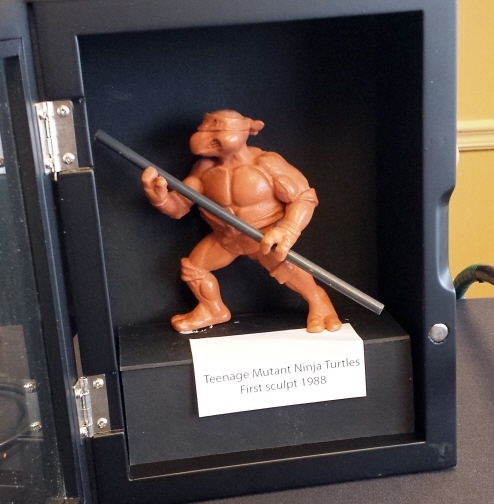 I also attended a panel with the designers of the Teenage Mutant Ninja Turtles. And here is the very first sculpture made of one of those funky pizza-eating amphibians. And of course, there was a costume contest. I went to Power-Con to learn behind-the-scenes secrets of an industry I've always wanted to know more about (as well as to give goosebumps to my inner-child). I'm definitely nowhere near being a fan on the level of most people at that convention. 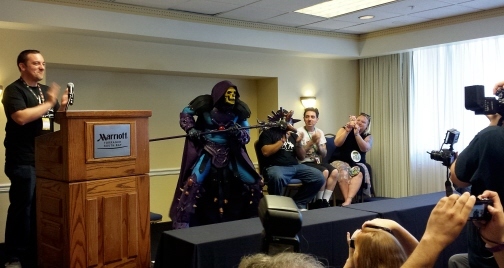 The most highly attended panel was one put on by Mattel to announce upcoming collectibles. I didn't attend that panel because my interests are in the history surrounding these properties. 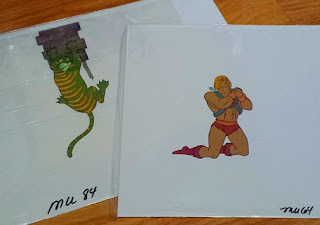 And that's why I left the convention with two original He-Man animation cells! Marie Antoinette, Serial Killer by Katie Alender. During a school trip to Paris, Colette realizes that the ghost of the historic queen is killing descendants of those responsible for her beheading. Searching for Sarah Rector: The Richest Black Girl in America by Tonya Bolden tells the rags-to-riches tale of an African-American girl in the early 20th century whose government-bequeathed land held millions of dollars’ worth of oil. Followers by Anna Davies. Someone has hacked Briana’s Twitter account and is live-tweeting murders on campus. The Living by Matt de la Peña. Shy’s summer cruise-ship job turns into a fight for survival when a massive earthquake hits Southern California. Dare Me by Eric Devine. Ben and his friends try to make a name for themselves by taking on a series of dangerous dares they film and post online. If You Could Be Mine by Sara Farizan is a debut novel about forbidden love between two young women in Iran. Fake ID by Lamar Giles. In this debut thriller, a teen in the witness protection program tries to maintain his cover while investigating his friend’s mysterious murder. Jack Strong Takes a Stand by Tommy Greenwald, illus. by Mendes Melissa. Fed up with being overscheduled, Jack stages a sit-in on the family couch. Hideous Love: The Story of the Girl Who Wrote Frankenstein by Stephanie Hemphill recounts the story of Gothic novelist Mary Shelley, who as a teen girl fled her restrictive home for her boyfriend, poet Percy Shelley. 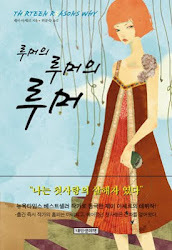 Reality Boy by A.S. King. Gerald, part of a TV reality show when he was five, struggles to break free of his anger as a teenager. Two Boys Kissing by David Levithan. Based on true events, this story stars two 17-year-olds about to take part in a 32-hour kissing marathon to set a new Guinness World Record. The Nine Lives of Alexander Baddenfield by John Bemelmans Marciano, illus. by Sophie Blackall. Wicked Alexander finds a way to transplant the nine lives from his cat into himself. 3:59 by Gretchen McNeil is a sci-fi horror story about two girls who are doppelgangers and see their worlds overlap every 12 hours. Being Sloane Jacobs by Lauren Morrill. Two very different girls with the same name meet by chance and trade places for the summer. Dorothy Must Die by Danielle Page. Oz has turned into a savage dystopia under Dorothy’s rule—and \now a new girl from Kansas must take her down. Forgive Me, Leonard Peacock by Matthew Quick. Leonard says goodbye to those closest to him on the day he hides a gun in his backpack and plans to kill his former best friend and himself. Tag Along by Tom Ryan. 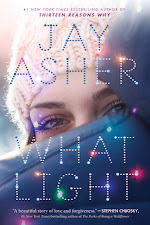 Four teens forge friendships on prom night as they help one another through disappointment, near-arrest, parental interference, and panic attacks. Who I’m Not by Ted Staunton. 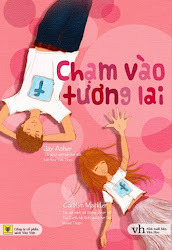 A kid in trouble with the law assumes the identity of a boy who vanished three years earlier. Fallout by Todd Strasser. In 1962, neighbors take refuge in the only bomb shelter around—the one that Scott’s dad was ridiculed for building. My Totally Awkward Supernatural Crush by Laura Toffler-Corrie. In this spoof of the paranormal genre, a dorky girl meets her true love, an angel, at an Outback Steakhouse. The Rule of Three by Eric Walters. What happens when the entire world goes dark? The Fantastic Family Whipple by Matthew Ward. Eleven-year-old Arthur is the only one of 13 kids in the family who hasn’t broken a world record. 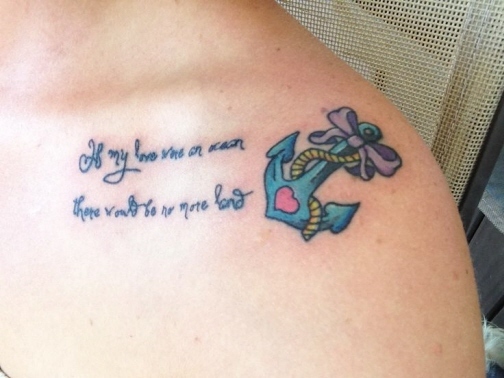 I've seen tattoos inspired by Thirteen Reasons Why before, whether it's a series of symbols to remind the wearer of certain ideas in the book, or a passage written on the back of a leg. Below are two different designs based around the first line of a poem in the book. I've seen the second design used on various art projects, but this is the first time I've seen it inked on skin. 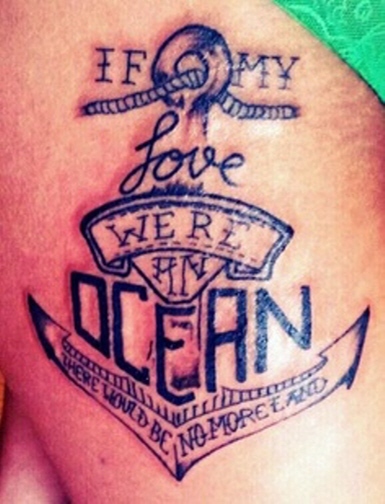 I wonder if this person knows where the line originated. If not, I at least hope he/she would like the book!